Moving right along, today I’ll be covering the blue cards in MTG Origins. The color seems to have two very distinct themes going on within it. On one side we have our artificers that bring artifacts into play and focus on things such as tempo spells, and on the other hand we have cards that deal more with the dark arts and have something to do with the graveyard. Without a clear theme in mind I think it will be hard to play a mainly blue due deck, but it should still be quite a good support color during the pre-release. Let’s take a look at my picks for the color. It’s not often that blue gets a big creature, and even rarer when that creature has trample. Innistrad brought us the Goliath the first time, but now he’s back and ready to stomp your opponent into the ground. The additional cost shouldn’t be hard to play in limited since most people will be playing 14+ creatures. What I really like about this guy is that he can block anything and he’s incredibly hard to get rid of without removal. Your opponent would have to commit 3 or more creatures just to kill him, and that would dangerous if you had removal in your hand to prevent him from dying. 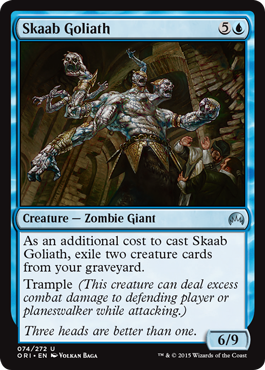 Blue will be playing flyers, and lots of bounce cards, and the Skaab Goliath goes along well with both. He’ll put pressure on an opponent and end a game quickly if your opponent doesn’t answer him. One blue mana symbol also seems splash-able as well. Probably one of the best non-rare blue creatures in the set. I was surprised as everybody else when they announced that Prowess would become an evergreen word in MTG, but it’s not a bad one to make permanent. Prowess creates a repeatable combat trick that will add more depth to a set and make playing spells more important than just beating somebody down with creatures. 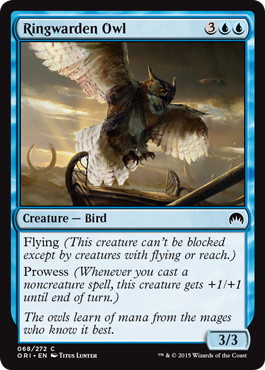 As for the Ringwarden Owl, I think he’ll be a good choice in any blue deck. 3 power in the air isn’t bad, and making him a 4/4 from time to time allows him to win quite a few battles against the other flyers in the air in Origins. While it’s not the most powerful card in blue, it gives you the best value and it’s only an uncommon. Four mana for 3 creatures and 4 power (2 of which are flying) is downright sweet, and being able to force damage through when you tap ANY artifacts is also a plus. I expect a card like this to go pretty high in draft, especially if there are some good UR cards available for a Thopter or flying deck. This seems to combo VERY well with Sigil of Valor and Throwing Knife. You can initiate an attack, tap your equipment, then sacrifice the Throwing Knife after battle for an extra 2 damage! If you manage to get this card, try to draft some good equipment as well. Not only will they be good on this card, but any other card you have as well becomes unblockable. Amazing with Renowned too. I see this in UR Artifacts, UW Renowned, heck it will be good in anything with more than 5 artifacts I think (especially if they are equipment). 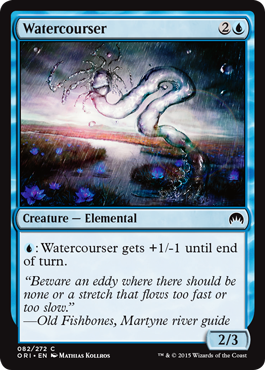 Watercourser is back in this set as well from M13. I liked it back then and I like it now. You get a 2/3 body that can easily turn into a 4/1 and trade with a bigger creature or hit for a nice chunk of damage. While it’s not amazing, it’s rather versatile for a common and would be a great card to have in your 3 mana spot. Great in an aggressive UW Tempo deck, but not bad in support roles in other blue decks too. I wouldn’t mind taking it as my 6th or 7th pick in draft if I was in blue. 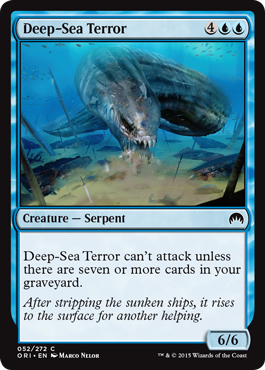 Thank god this doesn’t have something like Islandhome (where a creature can’t attack unless opponent has an island). Wizards has a long line of powerful, common rarity Serpents ranging back all the way to the first set. They never saw any type of play, and neither will this guy outside of limited. He’s going to play the role of a beater, and a big one at that. By turn 7 I would THINK you’d have 7 or more cards in your graveyard, but if you need help filling it up you can play cards like Screeching Skaab or Artificer’s Epiphany. This wouldn’t be my first choice in a limited deck, but if you need a beater in blue you’re not going to find much better than him or the Goliath. 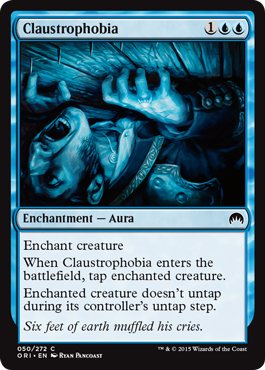 Our good ole friend Claustrophobia is back. This is the closest thing blue is going to get to solid removal. You can bounce stuff until you’re blue in the face, but if you want to lock a creature down you’ll need to use this card in blue. If there is one thing blue is weak in, it’s removal. As you know, removal is very important in limited and if you’re playing blue you’re going to be out of luck. However, if you’re playing white and have a card like Blessed Spirits or if you’re trying to activate Renowned in red, white, or green, this could help you out. Not something you want to take high in draft, but it’s better than nothing. 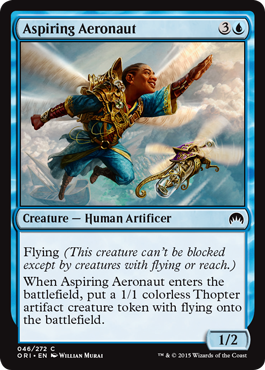 While not the best of the Artificers, it does have really good synergy in the UR Thopter deck, and it is 2 flyers for 4 mana. I could see this working well as the 23rd card in your deck. Not a great top deck, but if you have card that makes it better such as Thopter Spy Network. If you’re building a UR thopter deck you don’t have to take it too early, but don’t let it go around a second time in draft. 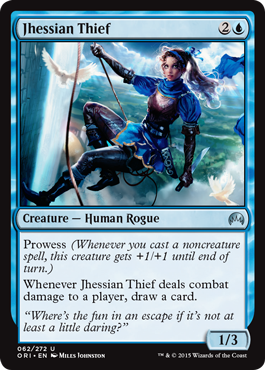 Speaking of card advantage, Jhessian Thief is also worth considering, especially if you have ways to give her evasion. Stratus Walk comes quickly to mind, but Whirler Rogue is also pretty good with her. If you can do that, she’s worth playing in your deck but otherwise I think you’d be better off with a creature with a higher power level and better ability. Artificer’s Epiphany – Good if you’re playing a Thopter/artifact deck, but also works if you’re focusing on Spell Mastery effects and want to both draw a card and fill your graveyard. Otherwise not as good as a card like Divination. Calculated Dismissal – if you’re playing a tempo deck this card isn’t that bad. You can counter a spell, then scry and set up your next two draws. Better than Clash of Wills I think. Disperse – Again, good if you’re playing aggro and need the tempo. Bad if you’re looking for permanent removal. Faerie Miscreant – The more of these you can draft the better it is. A 1/1 flyer for one is good, but even better if you have a way to abuse it. Scrapskin Drake – Cloud Elementals are always good as they block most of the other things in the air. He’ll definitely see some play but he’s nothing special. Send to Sleep – lots of good tempo spells in this set, but I’d always take forever removal instead of something to put their biggest threat to sleep for one turn. Alright in aggro decks. Separatist Voidmage – I like Aether Adept much more for 3 mana, but he’s alright too I guess. Not unplayable. Stratus Walk – Great for Aggro decks or when you need some evasion. The card draw is also good. Tower Geist – Flyers are always good, even if they are 4 mana. Good synergy with spell mastery as well. He draws you a card which is also good. Sphinx’s Tutelage – At 6 mana per use to “loot” a card it’s pricey, but it’s a small price to pay to have a re-useable affect that is hard to get rid of. The discard ability also works well with Spell Mastery effects, which is good if you’re building a deck around that effect. Blue definitely feels more like a support color this time around instead of a stand alone one. 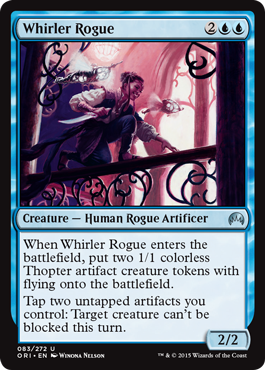 There are some cool cards, especially at rare and mythic rare, but I don’t think I’d want to be stuck with the color at the pre-release or in limited unless you have the cards for a good UR Thopters or UW Renowned deck. It just feels . . . underwhelming. What do you think of blue after seeing all the cards? Are there more synergies I’m missing or better color combinations? I’m sure I might have missed a few things, but that will become more apparent as I continue with my evaluation of cards in my next article. Look for the black article to be out soon! Thanks for reading and see you next time! I think you have vastly overrated Sphinx’s Tutelage, that looks unplayable to me. You are 9 mana and down a card (this enchantment which doesn’t affect the board) for your first loot. Tower Geist and Scrapeskin Drake look like very good value flyers to me. True, and you’re not the first person to say so. I’ll make some changes then.